Background: Antioxidants are proficient of stabilizing agents in the target cells and biological systems. The homeostatic equilibrium between the reactive oxygen species and endogenous antioxidants is important in maintaining healthy tissues. As some antioxidant agent’s show improved resistance, it is necessary to design the new heterocyclic molecules to form potent antioxidant agents with promising pharmacological applications. Moreover, thienopyrimidine derivatives has been the subject of much research due to their significance in different applications and their extensive potential pharmacological and medicinal activities like antibacterial, antifungal, anticancer, anticonvulsant, anti-inflammatory, analgesic, anti-viral, anti-oxidant, anti-diabetic and antimalarial properties. Although, recently rhodanine was reported as privileged hybrid in drug discovery and exhibited pharmacological activities such as anti-malarial, antibacterial, antiviral, antidiabetic agents. Hence, the development of new molecules within the scope of synthetic procedure of thienopyrimidine scaffold for heterocyclic synthesis would be worthy and well desired. Methods: All the target thienopyrimidine-rhodanine derivatives (5a-l) prepared from the Knoevenagel condensation with different substituted benzaldehydes in the presence of glacial acetic acid and 3-(thieno[2,3-d]pyrimidin-4-yl)-2-thioxothiazolidin-4-one (4). Although, all the synthesized compounds tested for their anti-oxidant activity investigated using DPPH radical scavenging, nitric oxide (NO) and ABTS activity. Results: All the thienopyrimidine-rhodanine derivatives (5a-l) were evaluated for their in vitro anti-oxidant activity. In fact, (Z)-5-(4-methylbenzylidene)-3-(thieno[2,3-d]pyrimidin-4-yl)-2- thioxothiazolidin-4-one (5c) with IC50 value 17.64 ± 0.06 µg/mL and (Z)-5-(2-nitrobenzylidene)-3- (thieno[2,3-d]pyrimidin-4-yl)-2-thioxothiazolidin-4-one (5j) with IC50 value 17.54 ± 0.23µg/mL showed excellent antioxidant activity nearly similar to the standard drug as an ascorbic acid (IC50 = 17.45 ± 0.03µg/mL). Conclusion: The objective of the present work was to design, synthesis and screened for their antioxidant activities of novel thienopyrimidine containing rhodanine derivatives with the hope of discovering new structure leads as the most potent antioxidant agents. Our aim has been achieved by the synthesis of thienopyrimidines with diver functionalities by exploiting 2-thioxothiazolidin-4-one chemistry and tested for antioxidant activity. The compounds 5c and 5j were found most potent activity compare to the standard ascorbic acid. 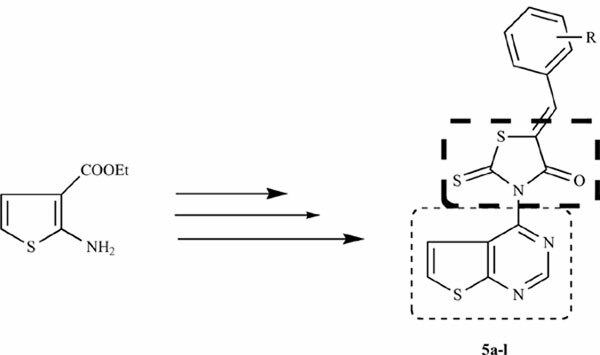 Furthermore, the electron withdrawing groups at position-4 in benzene ring enhanced the activity, whereas the compounds 5d, 5f, 5i and 5l showed good activity all the three radical scavenging methods. Keywords: Thienopyrimidine, rhodanine, synthesis, benzylidene, antioxidant activity, homeostatic equilibrium. Keywords:Thienopyrimidine, rhodanine, synthesis, benzylidene, antioxidant activity, homeostatic equilibrium. Abstract:Background: Antioxidants are proficient of stabilizing agents in the target cells and biological systems. The homeostatic equilibrium between the reactive oxygen species and endogenous antioxidants is important in maintaining healthy tissues. As some antioxidant agent’s show improved resistance, it is necessary to design the new heterocyclic molecules to form potent antioxidant agents with promising pharmacological applications. Moreover, thienopyrimidine derivatives has been the subject of much research due to their significance in different applications and their extensive potential pharmacological and medicinal activities like antibacterial, antifungal, anticancer, anticonvulsant, anti-inflammatory, analgesic, anti-viral, anti-oxidant, anti-diabetic and antimalarial properties. Although, recently rhodanine was reported as privileged hybrid in drug discovery and exhibited pharmacological activities such as anti-malarial, antibacterial, antiviral, antidiabetic agents. Hence, the development of new molecules within the scope of synthetic procedure of thienopyrimidine scaffold for heterocyclic synthesis would be worthy and well desired.